Maybe I'm just in a good mood today. I went to two places that normally I would hate but today I loved. Freeman's Sporting Club has a barbershop in the back. The store in front sells manly wool pants and plaid shirts. 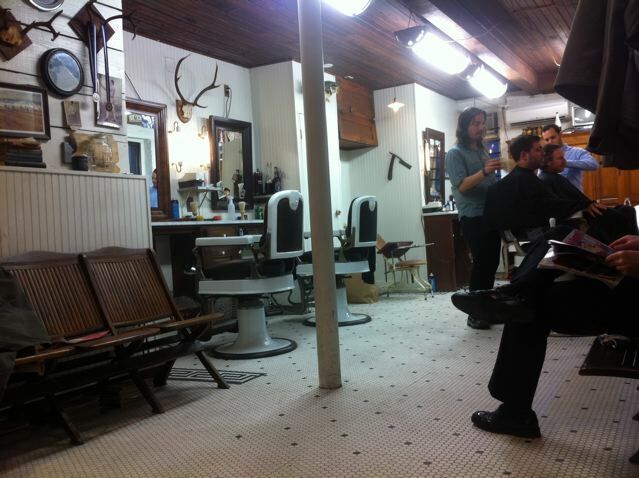 In the back they've styled the place to look like a place your dad would have gone (maybe). It's got an old TV set, tiled floors, old barber chairs, old photos of guys fishing, electric shaving cream dispensers... all things that would normally drive me crazy. But today, Sarah cut my hair, we chatted, and the place, even though I knew it was all designed to make me feel this way, felt very comfortable and good. Afterwards I went to Kiosk. A friend owns this store. She and her husband travel the world and bring back weird, unique, but everyday objects for people to buy. They have Japanese rice bowls, Danish dish brushes, Swedish packing tape and a broom from Wisconsin. The reason this would normally bother me is that I think it takes the fun out of finding these things yourself. The idea that someone else found it and is curating it makes me feel like a consumer. Today it didn't bother me, I got some great gifts and a few things for myself.